Specialising in Reflexology, Reiki, EFT Tapping and Indian Head Massage in Castle Cary, Julia and Kevin of Heal and Sole Holistics have an ethical approach to life and actively promote compassion for all living things. Julia and Kevin have created a peaceful and tranquil setting for their practice, enabling clients to start to relax from the moment they arrive for their treatment. All the products used in their Reflexology and Indian Head Massage treatments contain only top quality natural ingredients, are vegetarian and have not been tested on animals. Julia, a fully qualified Reflexologist, studied at Health Academics, a private training centre, near Wells, Somerset and gained a VTCT Higher Diploma in Reflexology. She was also awarded a VTCT Certificate of Excellence. She is a VRT Practitioner and is an authorised member of the Vertical Reflex Therapy (VRT) Network having trained with Lynne Booth in the Booth Method of Vertical Reflex Therapy (VRT). She has also trained with the award winning Sally Kay in Reflexology Lymph Drainage and is an Approved RLD Practitioner. Julia is a full member of the Association of Reflexologists. This Association only allows membership to those who have gained certification at a high level of training and who are committed to continued professional development as well as agreeing to abide by its Code of Practice and Ethics. It is one of the foremost aspirational and independent reflexology associations in the UK. Julia is also registered with NHS Choices, the UK's biggest health website, who only allow registration to the highest qualified Complementary Therapists. ​Julia also holds a Practitioners Diploma in Indian Head Massage. 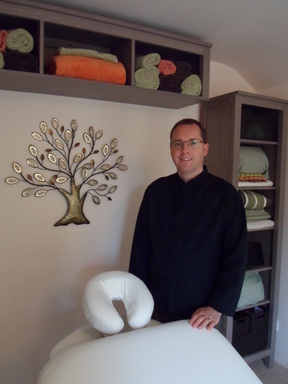 Kevin is a Reiki Master Practitioner and Teacher. He trained in the traditional Usui Reiki method of Natural Healing, under the guidance of two local Reiki Masters and can trace his lineage back to Dr Usui. He also holds a Reiki Council Professional Practitioner Certificate. The Reiki Council is the lead advisory body for Reiki practitioners in the UK and can verify that Reiki practitioners who are offering Reiki to the public meet the National Occupational Standards (NOS), which is the highest level of qualification available for a Reiki Practitioner. Kevin is a member of The Reiki Guild and is also registered with the Complementary and Natural Healthcare Council (CNHC). The CNHC was set up with government support to protect the public by providing a UK voluntary register of complementary therapists. CNHC's register has been approved as an Accredited Register by the Professional Standards Authority for Health and Social Care. Kevin also holds a Level 3 Practitioners Diploma with Distinction in Emotional Freedom Techniques (EFT Tapping) and is a member of the International Alliance of Holistic Therapists (IAHT).